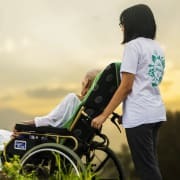 As a nurse, nursing student or practicing nurse clinician, hospice volunteer work can be an invaluable opportunity for professional and personal growth. Come make a difference and help to improve someone's quality of life, while gaining experience and skill by providing a compassionate presence and care to Kindred patients and their families in the Lafayette, IN area. Volunteers are an essential part of our dynamic interdisciplinary team (of nurses, doctors, spiritual care providers, social workers, and home health aides). Kindred Hospice volunteers may serve in a multitude of ways, including offering patient companionship (such as reading a book, engaging in conversation, actively listening by the bedside, playing card games, singing or holding someone's hand). Volunteers may also provide caregiver/family respite, engage in arts/crafts activities, and assist with special events such as memorial services and veteran pinning ceremonies for our hospice patients and families. Volunteers have the opportunity to touch the lives of our hospice patients and families in a very special way. Join the Kindred team today!